My painting day was quite hard today. A couple of phone calls interrupted me from a good start. I could not paint. And I got scared. I got the feeling that I would NEVER be able to paint again. Ever. Then I got a dear visit by my man and my son. I let my son paint a bit. I got relaxed. And within soon after they left I got started. I painted kinda weird, I admit. But I allow myself to do so. 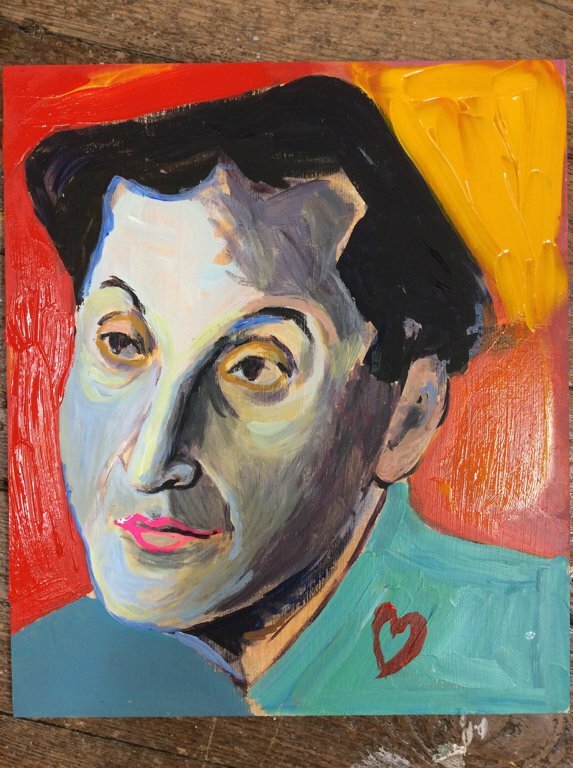 I painted "the lover boy". I reminded myself, what I had told myself in my first days in this studio; It is OK to paint ugly, as long as I paint. As long as I paint. I should paint! This really is a good reminder. It is one of my studio rules. My second studio rule is this. I should stay in the studio until I do something. I was happy when I walked home, today! And maybe I should not be afraid of tough working days after all. Maybe having them, doesn't neccesarily mean that I will never ever be able to again.